The Omega Seamaster Professional Co-Axial Diver’s 212.30.44.50.01.002 Men’s Watch – also known as the Omega Seamaster Regatta is both for professional and daily use. The countdown indicator is created specifically for high-speed water sports. A matte, more graphite-gray than black dial features yellow and silver accented hands and markers, with an entirely yellow chapter ring running around its edges. The five-minute regatta countdown tracker is integrated to the 30-minute chrono-register (3’o clock); the date window is at 6, which confuses a little about the 12-hour chrono-register if you don’t know it already. The matte black unidirectional rotating bezel of the Omega Seamaster Professional Co-Axial Diver’s 212.30.44.50.01.002 Men’s Watch is ceramic, not steel. It acts as a timer for longer spans. The helium-escape valve is on the case at 10’o clock while the regular seconds indicator is at 9. The caliber 3330 is built upon ETA architecture with Silicon being a part of the Co-Axial escapement as well. It is chronometer-certified and first appeared in the 2012 Speedmaster Racing. The Omega Co-Axial calibre 3330 movement uses column-wheel chronograph mechanism, its free sprung-balance fitted with a Si14 silicon spring. The power reserve is of 52 hours (approx) on a fully winded mainspring. Precise and solid, the Omega Seamaster Professional Co-Axial Diver’s 212.30.44.50.01.002 Men’s Watch exemplifies how precise timekeeping should be for Regattas. The Omega Seamaster Professional Co-Axial Diver’s 212.30.44.50.01.002 Men’s Watch was built to celebrate the continued relationship between Omega and the ETNZ, the Emirates Team New Zealand. The event was the 2013 edition of the American’s Cup boat-race. Omega’s long term contribution to the building of millions-of-dollar worth racing yachts and catamarans shows through each of the 2,013 watches. ETNZ, in return, genuinely appreciates Omega’s support and long-term dedication to the sport. At 44mm across, the Omega Seamaster Professional Co-Axial Diver’s 212.30.44.50.01.002 Men’s Watch has a fantastic size and improvements upon the Seamaster design but without ruining its classic appeal. The boating chronograph or alternatively, regatta timer – this Omega designed watch counts the minutes before a race starts. The color scheme matches that of the ETNZ team boats. The case back bears an engraving of the ETNZ team logo. It also mentions about the 34th anniversary of sponsoring the American’s Cup. It is one of Omega’s marine-themed timepieces, but this time, Omega built a true sailing watch. Still better – it’s an entry-level Omega that offers value and shares a lot of features from the Seamaster Planet Ocean chronograph. The metal bracelet of the Omega Seamaster Aqua Terra Men’s Watch looks incredibly cool. It has the feel of the sport and the feel comes without having to try at all! It’s easily wearable as a daily timepiece. What we appreciate so much about the Omega Seamaster 300M Chronograph ETNZ is that it reminds us of a time not so long ago when an Omega wasn’t an almost $10,000 investment. Sure, the brand has upgraded many of its products and features, but they have also priced themselves out of reach of many people who miss being able to afford new Omegas on a somewhat regular basis. While the ETNZ version will be limited to 2,013 in black and red, a non-limited version of the Omega Seamaster Professional Watches will come out soon in black and yellow. 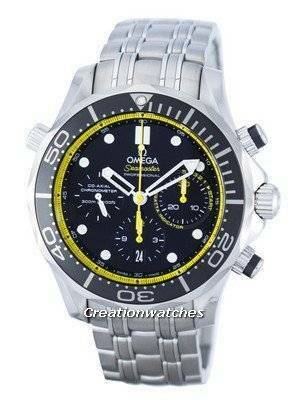 This entry was posted in Omega Watches and tagged Omega Mens Watches, Omega Seamaster Professional, Omega Watches on November 16, 2017 by citizenwatches.